UPSC Notification is out. 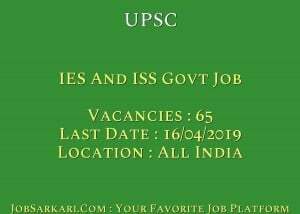 UPSC is recruiting for 65 IES And ISS Govt Job Posts. You can check UPSC - Uttar Pradesh Public Service Commission last date, download UPSC notification, visit UPSC official website and check other UPSC Vacancy details.Complete Vacancy and recruitment Details about 65 IES And ISS Govt Job vacancies in UPSC are provided below by JobSarkari.Com only for you. Last Date of Apply Online. 16/04/2019 till 06:00 PM Only. Last Date for Payment of Application Fee. 16/04/2019. Mode of Payment Application fees can be Paid through Online Mode or Offline through E-Challan Making Payment at Any SBI Branch. Indian Economic Services (IES) Candidate Must Have Passed Post Graduation Degree in Economics / Applied Economics / Business Economics / Econometric. 21 to 30 Years. 32. Indian Statistical Service (ISS) Candidate Must Have Passed Graduation in Statistics / Mathematical / Applied Statistics / or Post Graduation in Any of these Subjects. 21 to 30 Years. 33. Total No. of Post 65. 2. Click Apply Online Link given on Our Website in Important link Section. Register Candidate Not Need to Register Again. 6. Upload the Scanned Copy of Documents in Prescribed Size and format. 7. Take Printout of your Application form for future Reference. 8. Online Application Can be Submitted On or Before 16th April 2019. Q. What is the Last Date For UPSC IES And ISS Govt Job Vacancy ? A. 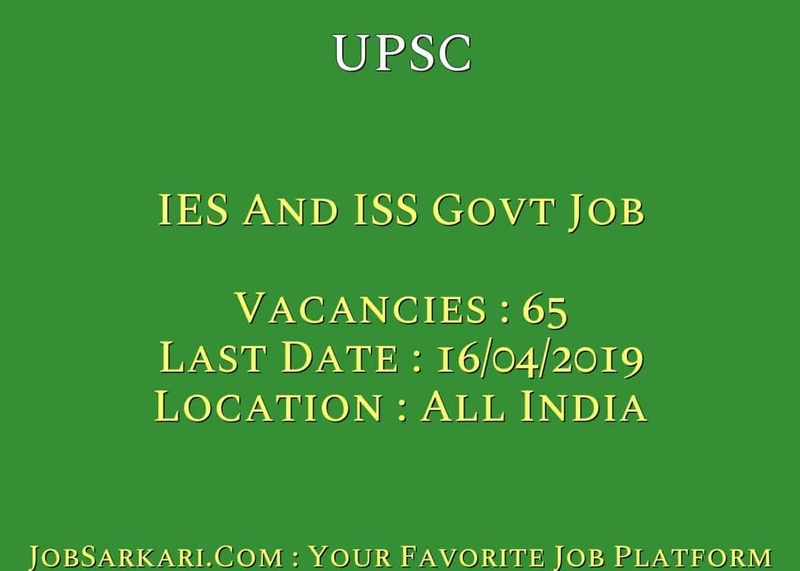 Last Date for UPSC IES And ISS Govt Job Posts is 16/04/2019. Q. What is the Form Type of UPSC IES And ISS Govt Job Recruitment ? A. The Form Type for UPSC IES And ISS Govt Job Posts is Online. Q. How many vacancies are available in Uttar Pradesh Public Service Commission IES And ISS Govt Job Posts ? A. There are about 70 Vacancies in Uttar Pradesh Public Service Commission IES And ISS Govt Job Posts. A. Full Form of UPSC is Uttar Pradesh Public Service Commission .